1. Store your bobby pins in a magnetic paperclip holder. I've been doing this for years, and there are no words to describe how well it works. From here. 2. Use rubber bands, pipe cleaners, or hot glue to keep your clothes from falling off their hangers. So simple, so brilliant. From here. 3. Repurpose a cheap lid organizer into a way to organize your clutches. No more digging through a bottomless bin to find what you're looking for. From here. 4. Make your earrings easy to find by sorting them into ice cube trays. Then keep those trays in your jewelry drawer. Read more here. 5. Store all of your extra buttons on safety pins. This won't work well if you have like, a button collection, but will totally help you keep track of extra buttons that come with your clothes without having a pile of those tiny paper packets. 6. Keep your charger and earbuds safe in your purse or luggage using an old sunglasses case. Goodbye, tangled wires! From here. 7. Use washi tape to mark your phone's charger so you can always pick it out from everyone else's. Or from all the other white Apple cords you have at your desk or on your bedside table. From here. 8. Stop your smartphone's storage problems in their tracks with a little bit of memory management. Get tutorials for both Andriods and iPhones here. 9. Clean up the cords behind your TV with some cheap cable ties and removable adhesive hooks. Here's the tutorial. You can also use adhesive hooks made specifically for cord control, but it might take more of them if you have lots of cords. 10. 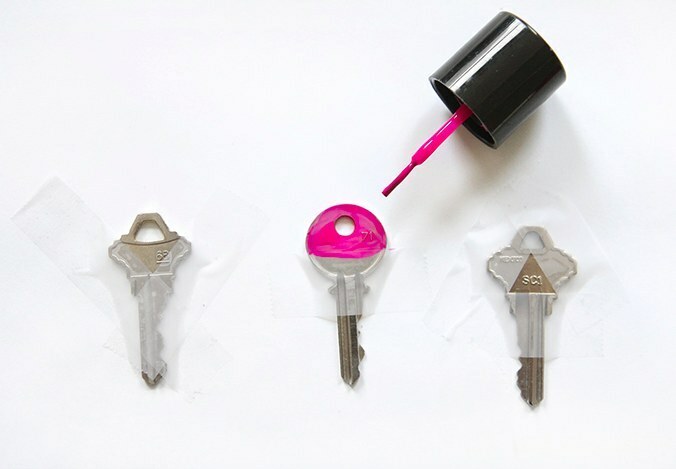 Paint all of those similar keys with nail polish so you don't waste time trying three different keys ever again. 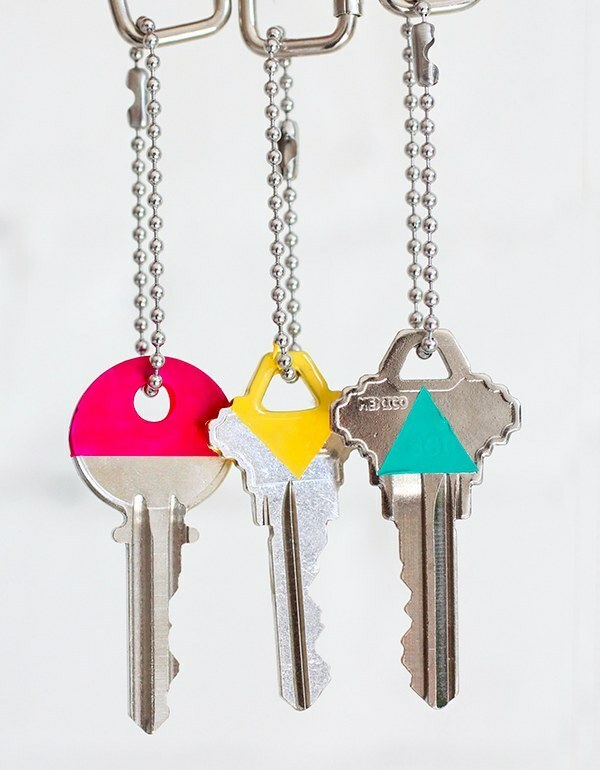 Plus your keyring gets to be more colorful. Get the tutorial here. 11. 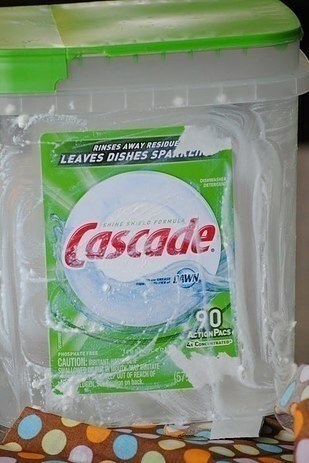 Make a free car trash can using an old dishwasher tablet container. Here's how to cover it with fabric, if you want it to be ~pretty~. 12. Secure clothespins on the inside of your cabinets to create a little bit of extra storage. You can use removable adhesive strips, or even just a little hot glue (as long as you're not renting). Here's the tutorial. 13. Keep a lazy Susan under your kitchen sink to make all of your cleaning supplies easy to grab. Or under your laundry room sink, if that's where you store this stuff. Get more organizing tips here. 14. Use a wine bottle rack to keep your water bottle collection neat. Get a similar one here, or just use a cheap one. 15. 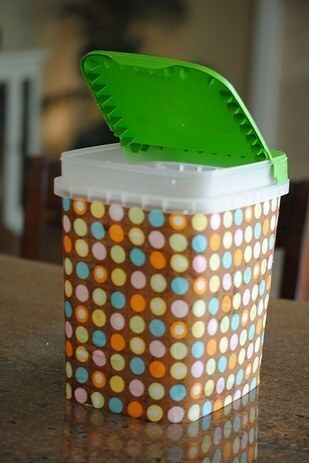 Turn an ordinary plastic container into a divided plastic container using cupcake liners. Silicone ones are reusable, but you could also use paper ones. From here. 16. Hang a tension rod about your washer and dryer to hold hang-dry clothes and your detergent. No cabinets? Problem solved. From here. 17. Prevent your trash bag from slipping down by securing it with binder clips. Especially helpful if your roommate bought the wrong size bags for your can. Read more here. 18. Set up a battery recycling station with an old coffee can. And you can use a second can for recycling medicine (which you may need to bring back to your pharmacist). Read more about it here. 19. If your family is always leaving their junk around the house, institute a "crap basket" system. You can put their stuff in their crap basket, then they can take their basket back to their rooms to put everything away. Learn more about the system here. 20. Keep your folded sheets in their respective pillow cases, so it's always easy to grab the whole sheet set at once. You will have to figure out how to fold a fitted sheet for this to work, though. Read more at Martha Stewart. 21. Keep a laundry basket in your trunk, so you can carry in all of your groceries at once. When you're unloading your grocery cart, just put all the bags in the basket. Then carry the basket inside when you get home. All of these tricks are from our weekly series of organizing ideas — you can see previous roundups here, and watch out for new editions each week!